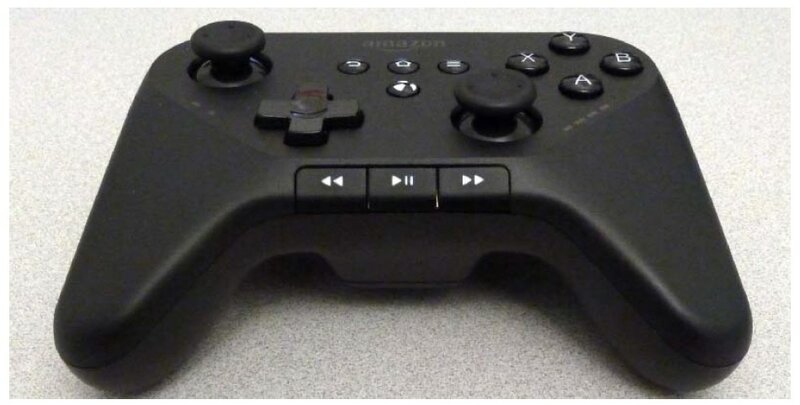 We still don't know for sure whether Amazon is going to release a gaming console slash set top box, but today we did get our first glimpse of what may be the Bluetooth controller which Amazon plans to release alongside their console. Dave Zatz of ZatzNotFunny reported this morning that he found an Amazon branded gaming controller on the website of "an overseas regulatory agency, similar to our very own FCC". He doesn't say exactly where he found it (The Verge says that this came from Brazil), but he did post a few photos and share a few details. Update: Engadget posted a link to the original PDF. This controller has the usual excess of triggers, joysticks, and buttons. It is powered by a couple AA batteries, and if you zoom in on the photos you'll see familiar Android home, menu, and back buttons on the face. There's also a button for Amazon GameCircle (or at least it looks similar to that service's logo). I followed up on this with Dave, and he says that he has found the controllers on a couple different regulatory websites, which means that Amazon could be planning a global launch for this controller and its related gaming console. Amazon has long been rumored to be interested in releasing some type of game console or streaming video box, with rumors circulating for well over a year (it even has a name: FireTube), but this is really only the third solid piece of evidence to show that the rumors aren't just gossip. In early February 2014 Amazon bought a gaming studio, and a few weeks later a BB planogram leaked which which showed that Amazon would have an Apple TV competitor in that store by May. And now that we have controllers to look at, I would say that it is a pretty safe bet that Amazon will launch a gaming console this Spring. It will probably run Android, be tied into Amazon's content stores, and it will likely ship with both Hulu and Netflix apps. But there's still no solid info on price or the exact launch date, so stay tuned. Looks ugly to me. They must be planning to release something super cheap. Otherwise, they should have come up with a more sophisticated design. It is pretty ugly, yes. And powered by AA batteries? Whose bright idea was that. Amazon just happens to sell AA rechargeables right – makes sense. The Xbox 360 and Xbox One controllers both run on AA batteries. MS offers rechargeable packs for the controllers but they are separate accessory purchases. One important difference between the Amazon models and the Xbox controllers is that the Amazon controllers don’t have an obvious docking port for charging. That’s what threw me, initially. I should have known better than to complain; my cordless phones have rechargeable AAA batteries. They work fine. Why is there red on some of the buttons. Is that blood? Did someone die to get us these pics or were they just die hard Angry Bird players?